SEC Saturday Storylines: Are Texas A&M’s Title Hopes Still Alive? There’s still plenty at stake in the SEC this weekend even if it doesn’t have quite the same juice as last weekend’s schedule. Kentucky can continue its seemingly inevitable charge at the SEC title in College Station and several other teams can play themselves further onto (Alabama) or off (Georgia, Vanderbilt) the bubble. Here are three things to watch for in this weekend’s SEC action. Texas A&M’s last stand. Drawing comparisons to the Alamo may be overly dramatic but the Aggies will be up against it on Saturday evening. A few short weeks ago the Kentucky game looked like it would be the SEC game of year. Despite Texas A&M’s 2-5 slide over the past few weeks, this game is still getting the bright-lights treatment with ESPN‘s College Gameday broadcasting from College Station. This could represent a swing game for Aggies. A win draws A&M within one game of the Wildcats and Mississippi State, Missouri and Auburn due next. 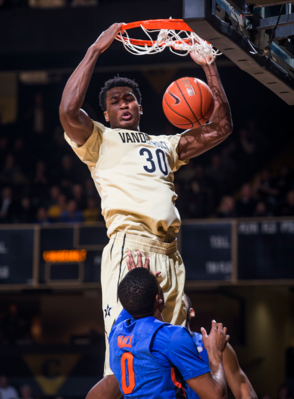 Kentucky’s next three games against Alabama, Vanderbilt and Florida are considerably tougher. This scenario of course assumes that both teams completely reverse their recent runs, but it’s nonetheless a path for Texas A&M. A game storyline worth watching is whether Tyler Davis and Jalen Jones can take advantage of a Kentucky frontcourt that might be without Marcus Lee — he was held to just 17 minutes against Tennessee due to a back injury. The thought of Isaac Humphries or Skal Labissiere trying to contain either of those guys must have John Calipari worried. On the other end of the floor, the Wildcats’ three-point marksmen Jamal Murray and Derek Willis (yes, he’s earned that title) will face a defense that has struggled to defend perimeter shots at times this season. 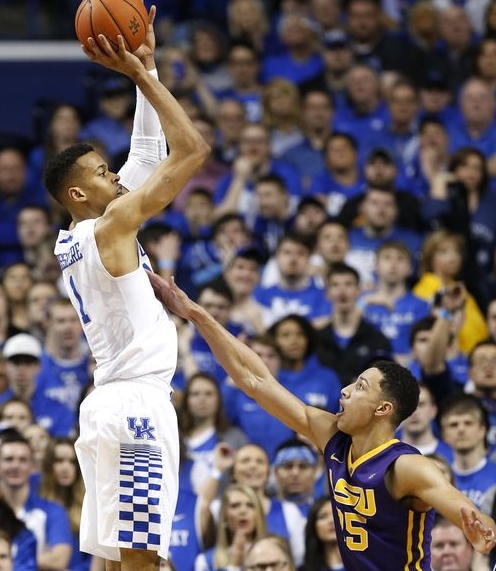 Kentucky and LSU separated themselves from the pack on a pivotal weekend in the SEC title race. If both teams hold steady the rest of the way, we could have a gigantic game between the pair in Rupp Arena to close out the regular season. Plenty of drama is also heating up near the bubble, with Alabama staking a claim to a spot in the conversation. 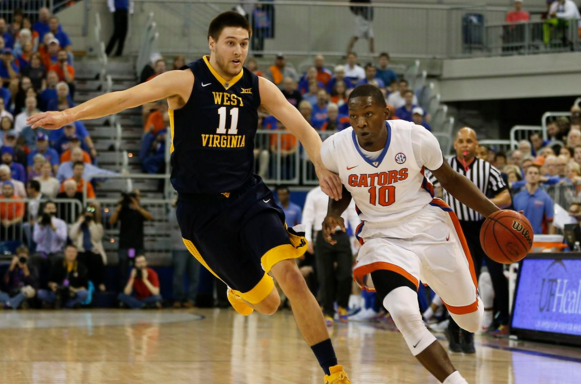 Here’s what went down last week in the SEC and what to look for in the week ahead. 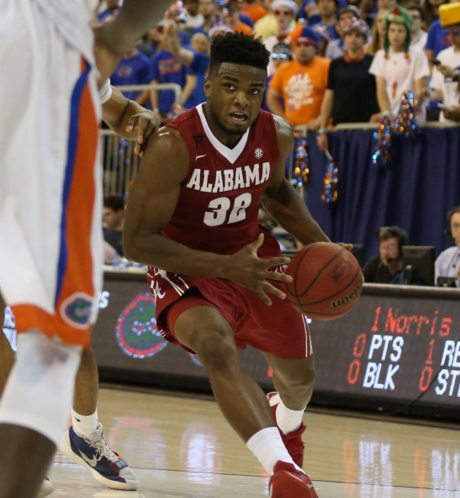 Retin Obasohan and Alabama won in Gainesville for the first time since 1995 (rolltide.com). Trending Up. Alabama. The Crimson Tide’s RPI surged up to #37 after four straight wins, including two victories last week over likely tournament teams (Texas A&M and Florida). It’s easy to forget that Avery Johnson’s club started SEC play at 1-4, but that looks understandable in hindsight, considering those games included losses to Kentucky, Vanderbilt and LSU. The fourth loss (at Auburn) is really the only dark spot on the resume, although the Tigers had the services of Kareem Canty in that one. Welcome to the bubble, Alabama. Trending Down. Texas A&M‘s seed. Just a few weeks ago the Aggies looked like a solid #2 seed in the NCAA Tournament, with a realistic shot of climbing up to the top line if things broke their way. Their recent four-game losing streak hasn’t put an invitation at risk, but it has done great damage to what could have been a historic placement for the program. With the exception of a home game against Kentucky, the schedule eases up quite a bit and should allow A&M to build some confidence before heading to Nashville. What a difference a few weeks can make. It wasn’t too long ago that the big mystery in the SEC was which team would finish second to Texas A&M. Instead, LSU now finds itself in sole possession of first place, and the Aggies’ defense has shown some cracks during a three-game conference losing streak. 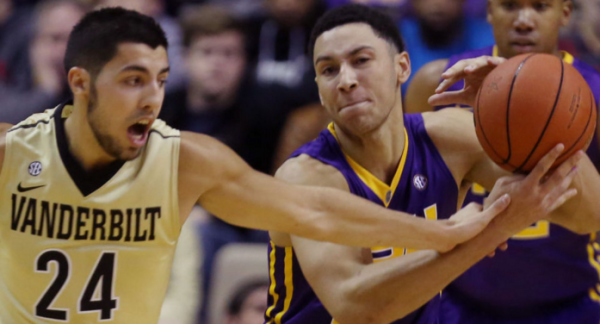 Here’s what happened last week in SEC hoops and what to look for in the week ahead. 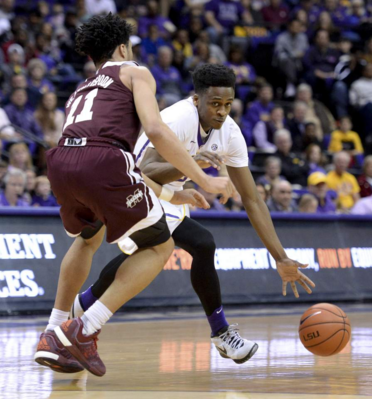 Antonio Blakeney had the best game of his young college career against Mississippi State (theadvocate.com). Trending Up. Antonio Blakeney, LSU. Even when his shots weren’t falling early in the season, Blakeney was still playing hard and bringing value on defense. In SEC play, the shots have been falling more frequently (+5.5% eFG), however, and the freshman put together his best game to date (31 points on 4-of-8 from three) last week against Mississippi State. If he continues to cash in on his lofty potential, defenses will have one more dynamic playmaker to contend with along with Ben Simmons. Trending Down. Confidence that the SEC will have many teams playing past the first weekend of the NCAA Tournament. 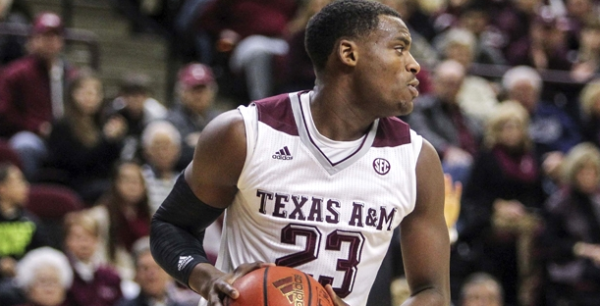 Texas A&M, LSU, Kentucky and Florida all showed potential against high quality opponents in the Big 12/SEC Challenge. Yet last week the Aggies dropped two games, Florida’s normally stout defense was lit up twice, and the Wildcats coughed up a 21-point lead in a loss to Tennessee. These teams’ potential is there, but there’s plenty of inconsistency right alongside it. The regular season title is solidly Texas A&M‘s to lose at this point as the Aggies are two games clear of a trio of second place teams. But if college basketball has taught us anything this year it’s that the game can be fickle. Here’s what the Aggies and rest of the league were up to last week. 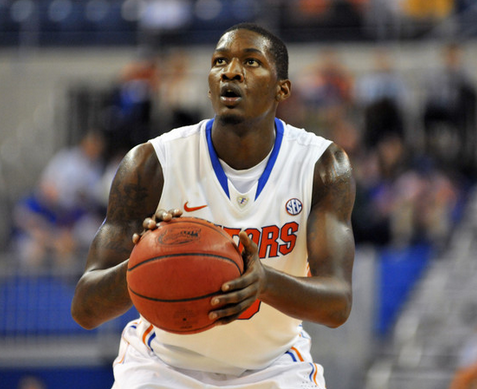 Dorian Finney-Smith and Florida are hanging around in the race for the regular season title (zimbio.com). There is suddenly uncertainty everywhere in the SEC, as league representation in this year’s NCAA Tournament is still very difficult to predict. At one end of the spectrum, the league could realistically see as few as three teams get the call on Selection Sunday. But on the other end, if a bubblelicious group of SEC teams finishes strong, the league could see as many as seven teams in the field of 68 if things break right. There’s a lot left to settle, but here’s what we learned over the past week. A shorthanded Auburn picked up an emotional win over Kentucky (auburntigers.com). Team of the Week. 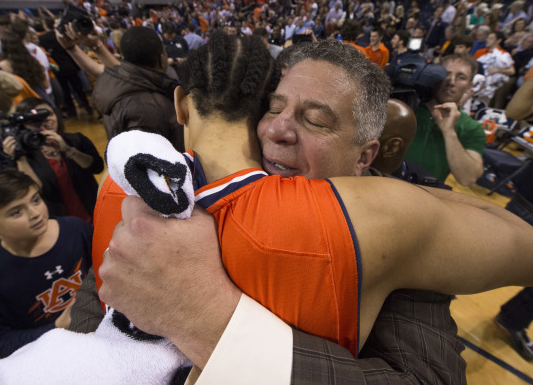 It hasn’t been an easy year for Bruce Pearl and Auburn. His 2016 recruiting class generated buzz, but injuries and eligibility issues have kept it from transforming into production on the court. This, coupled with a string of injuries to the back court (including Tahj Shamsid-Deen being officially ruled out the rest of the way), have put Auburn in a tough spot. The lowest point of the trying season came in a blowout loss to Mizzou ten days ago, but what a difference a week makes. The Tigers beat Kentucky for the first time since 2000 in front of a rabid crowd at Auburn Arena. This was the first signature win for Pearl on the Plains, and for that, the Tigers have earned team of the week honors. The SEC began last week with the long-awaited Ben Simmons against Kentucky showcase and ended with the annual reappearance of John Calipari to the Nets rumors. Here’s what happened in between. 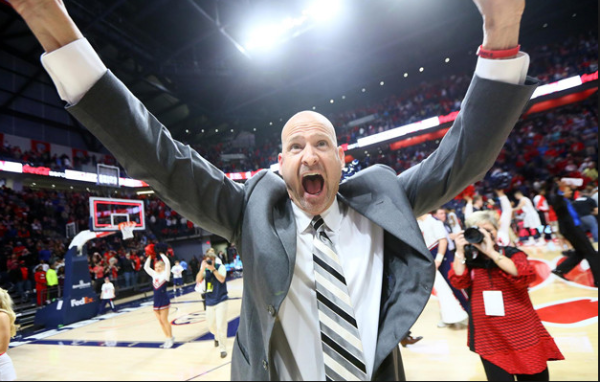 It was an exciting first week for Andy Kennedy and Ole Miss in the Pavilion (uga.rivals.com). Sign Andy Kennedy up for a few more weeks like that. The Rebels had loud, capacity crowds for their first two games in the Pavilion and the players on the floor didn’t disappoint. Ole Miss first overcame an eight-point halftime deficit to down Alabama, and then erased Georgia’s four-point lead with less than a minute to eke by the Bulldogs. As usual, Stefan Moody played a starring role in both wins, including a whirlwind game-winning layup against Georgia. The contributions of Sebastian Saiz shouldn’t be overlooked either, as he continued to be an active force in the paint with a pair of double-doubles. The Ole Miss program has some serious energy surrounding it right now. You could hand this to a number of guys — Moody, Saiz and (as always) Simmons come to mind. But this week’s honor goes to Anthlon Bell whose torrid three-point shooting and 51 points over two games led Arkansas to home wins over Vanderbilt and Mississippi State. Bell spent his first three seasons in Fayetteville as a solid but unspectacular option that Mike Anderson utilized in short bursts. With increased playing time during his senior season, he’s exploded in production. Bell leads the SEC in three-point percentage (47.1%) despite taking the third most three-point shots (104) in the conference. Conference play is off and running in the SEC as some teams finished up their non-conference schedules and several others opened league play. Here’s what happened in the final week before it’s all SEC, all the time. Team of the Week. LSU has caught a lot of flak on this microsite with good reason. Despite boasting arguably the best player in the country, the Tigers have spent most of the season trending in the wrong direction. Still, Johnny Jones‘ team deserves accolades when things go well, and the Tigers’ surprise win over Vanderbilt in Memorial Gym on Saturday merits such a mention. Jones’ club still has a steep hill to climb if it is to enter NCAA Tournament discussion, but consider the following: Ben Simmons (36 points, 14 rebounds, four assists) seems comfortable playing the two-man game with Keith Hornsby (23 points) and Craig Victor (11 points). That pair was not around for the majority of the team’s losses this season, so there is now some reason to believe that the Tigers can surge with a complete roster. There’s also equal reason to believe that they’ll continue to underwhelm. Only time will tell in Baton Rouge.